Some people say that you get what you pay for, however, with this facility when compared to the rest you get much more then you pay for. First I would like to say thank you for helping me get my life back. It’s almost an overwhelming feeling not having to worry about having enough pills to get me through the week. I no longer need pills to help me feel normal. Not only that, I researched every rapid drug detox in the country and yes this center was the most economical. So naturally I was skeptical. It’s obvious that money isn’t their main concern, it is definitely the patient. What really made me feel the best was the availability and genuine concern of Jeanne. I must say, she is one of the best people you’ll never meet, she’s the invisible angel. The procedure itself is virtually painless, I personally felt fantastic within two days. Some people say that you get what you pay for, however, with this facility when compared to the rest you get much more then you pay for. I am 27 years old and my life was completely consumed with the pills. I guess I was a functioning addict but now I am just a functioning person who has been freed of the shackles of addiction. In my opinion I owe my life to the rapid drug detox center. I will be starting law school in 2009 and once I start to make enough money I would like to sponsor people who need the help but can’t afford the procedure. That is how much I believe in Jeanne, the Doctors, and staff at Rapid Drug Detox Center. It is just so hard to put into words what the three aforementioned people have done for me, my family, and my fiancé. 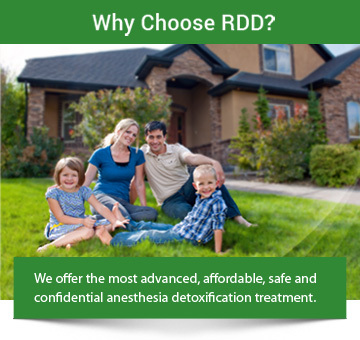 If you want the best care and the best possible results I suggest you choose the Rapid Drug Detox Center. If any prospective patients have doubts or questions I am definitely available to help in any way possible. If you want your life back and continued care to make sure you are successful choose The Rapid Drug Detox Center.